The Artist Masterclass Retreat Stranger Than Fiction: Journeys from Books to Art led by renowned Spanish artist Dora García. Please note that the deadline for applying for this retreat has now passed. 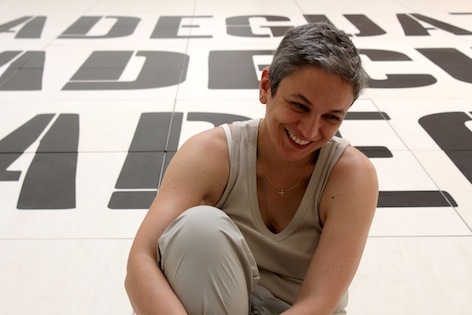 Spanish artist Dora García is known for her work with performance, film and video, often made in collaboration with others, or by inhabiting existing broadcast networks or structures. Her subject matter and materials, or techniques, defy categorization and range from philosophy and politics, to popular culture, stand-up comedy and television, often mixing reality and fiction. This retreat Masterclass, entitled Stranger Than Fiction: Journeys from Books to Art, will introduce García’s working methods, via three complex projects that arose from her encounters with fiction: The Beggar's Opera for Münster Sculpture Projects (2007); Die Klau Mich Show, for documenta13 (2012); and The Joycean Society (2013). García and the selected retreat participants will work together to develop ideas for a collaborative work using the novel Artificial Respiration (1994) by Ricardo Piglia as a departure point. Selected participants for the retreat are: Ami Clarke, Valerio Del Baglivo, Patrick Goddard, Agnieszka Gratza, Richard John Jones, Jenny Moore, Lorena Muñoz-Alonso, Marie Toseland and Jess Wiesner.